JUST AS I WAS wondering how to start this review, along came the Sunday New York Times Magazinewith a short article by Adam Davidson with the title “Made in Austria: Will Friedrich von Hayek be the Tea Party’s Karl Marx?” One Tea Party activist reported that his group’s goal is to fill Congress with Hayekians. This project is unlikely to go smoothly if the price of admission includes an extensive reading of Hayek’s writings. As Davidson remarks, some of Hayek’s ideas would not go down well at all with the American far right: among them is a willingness to entertain a national health care program, and even a state-provided basic income for the poor. This apocalyptic tone survived into the period dominated by Milton Friedman, who is the subject of the second half of Burgin’s book. It is the language of the Tea Party Hayekians. In 1976, Friedman told an audience at the University of Pittsburgh that he welcomed the inefficiency of government: “If the government were spending the forty percent of our income that it now spends efficiently, we would long since have lost our freedom.” In 2004, Friedman told The Wall Street Journal that, although the battle of ideas had been won, “currently, opinion is free market while practice is heavily socialist.” The point to keep in mind is that “socialist practice” includes the Food and Drug Administration (FDA), the certification of doctors, and the public schools. The atmosphere in which Burgin’s narrative takes place is permeated with this kind of rhetoric. But of course for those of us trying to live on this planet, the issue is not between free markets and socialism/collectivism; it is between an extreme version of free markets and effective regulation of the shadow banking system, or between an extreme version of free markets and the level and progressivity of the personal income tax. The metaphor of the slippery slope is largely an invention to scare off pragmatic exploration of the policy landscape. The academics thought that they had found the popular voice they desperately needed, one heard regularly by ten million Americans. The Europeans organized a colloquium to be held in Paris in August 1938 to celebrate the publication of the French translation of Lippmann’s book. The meeting apparently spent itself on minor differences of opinion among the faithful, and ended rather inconclusively. Whether on account of this experience or out of natural moderation, Lippmann soon distanced himself from this incipient movement. He and his ideas went elsewhere. But the group continued its efforts to organize something, anything. Money was hard to come by, and the main participants were not of one mind about whether the old liberalism needed to be fundamentally reformed or had never been properly tried. An attempt by Röpke to establish a journal of neoliberal ideas went nowhere. Finally, in the spring of 1947, with a grant from the Volker Fund of Kansas City, who were the Koch Brothers of their time, Hayek was able to bring together a collection of thirty-nine colleagues for ten days in Vevey, Switzerland, to begin the work of transforming nineteenth-century liberalism and converting it into a force in the world. This was the birth of the Mont Pèlerin Society (MPS), around whose later history Burgin organizes the rest of his narrative. It is a useful device; but I fear that it tends to endow the MPS with more significance than it ever really had, whether within the economics profession or in the world at large. I wish Burgin had included a full list of the original attendees at Vevey. He mentions that the “room was filled with journalists, businessmen, and academics from across the Atlantic world.” So this was not intended as a merely academic discussion, though Hayek and Robbins were pretty clearly the guiding spirits. By now it was possible to identify the Soviet Union and communism as the main source of menace, which was natural enough, given the times and the all-or-nothing predisposition of the group; but the temptation to frame the intellectual issue as Free Markets v. Communism more or less guarantees that all the important practical questions about economic policy and social policy will disappear from view. According to Burgin, the first attempt by the conferees “produced a list of foundational convictions that assailed the socialist menace, lauded the virtues of the competitive market, and drew connections between economic freedoms and the ‘intellectual freedoms’ that totalitarians sought to erode.” A nod to Hayek’s own moral concerns asserted the necessity of “a widely accepted moral code” governing collective as well as private action. There is not much guidance here for a member of the Interstate Commerce Commission who has to worry about the regulation of imperfectly competitive railroad and trucking industries. Even so, there was grumbling and disagreement about that moral code, about the proper degree of emphasis on private property, about whether such language had an adequately positive and progressive tone. It must have been all too easy to fall back on the defense of capitalism against the encroachments of socialism, on which everyone could agree, to no great purpose. The inability to agree about this sort of thing, or even to face up to it, seems to have dogged the MPS throughout its early years. This may be one reason why it was never the public force that Hayek had originally hoped to establish. The membership grew from the original thirty-nine to 167 in 1951 and 258 in 1961. There is no way to tell whether this growth reflected the spread of free-market ideas or the willingness of the founding members to tap a supply that was already there. Either way, these numbers guaranteed that Hayek’s ambition—to rebuild a modernized neoliberalism on ethical foundations other than simple individualism—would go nowhere in the MPS. The range of opinions was too wide, even in a handpicked group of this size. Inevitably, serious discussion was replaced by prepared presentations followed by comments consisting largely of station identification. So far as I know, the MPS never produced and distributed an agreed public statement of its program. Outside the economics profession, it was invisible. The MPS was no more influential inside the economics profession. There were no publications to be discussed. The American membership was apparently limited to economists of the Chicago School and its scattered university outposts, plus a few transplanted Europeans. “Some of my best friends” belonged. There was, of course, continuing research and debate among economists on the good and bad properties of competitive and noncompetitive markets, and the capacities and limitations of corrective regulation. But these would have gone on in the same way had the MPS not existed. It has to be remembered that academic economists were never optimistic about central planning. Even discussion about the economics of some conceivable socialism usually took the form of devising institutions and rules of behavior that would make a socialist economy function like a competitive market economy (perhaps more like one than any real-world market economy does). Maybe the main function of the MPS was to maintain the morale of the free-market fellowship. THE SCENE GOT more interesting when the de facto leadership of the MPS (and whatever movement it represented) passed from Friedrich von Hayek to Milton Friedman, thirteen years younger and eventually altogether different in style and, to some extent, even in ideology. Friedman (I will refer to him this way, though he was a long-time personal friend and political opponent) attended the meeting of the MPS in April 1947, presumably at the insistence of his brother-in-law Aaron Director, an older Chicago fixture and a rigid right-winger. Friedman was then a junior scholar. His main professional achievement so far was an excellent empirical study, Income from Independent Professional Practice, written with Simon Kuznets, which served as his Ph.D. thesis at Columbia. But he was also the co-author with George Stigler of a well-written and well-argued pamphlet against rent-control called Roofs or Ceilings?. In it, the authors recognized that allowing rents to respond freely to market forces would automatically give only the affluent access to comfortable housing and confine the less well-off to often miserable living conditions. But, they argued, although this was deplorable, the correct remedy was to choose public policies that would reduce inequality, not to try to offset it by distortion of the market for rental housing. The conservative sponsors of the pamphlet objected to this heresy about inequality. Friedman and Stigler stood their ground. In the end, the sponsors forced the inclusion of an editorial footnote suggesting that those alternative policies would consist mainly of undoing other errors committed by government. There is a lesson to be learned from this episode, but opinions might differ as to what that lesson is. When Friedman became president of the MPS in 1970, the number of members had risen to 330. One of them had remarked privately, a few years earlier, that the sessions had lost their intellectual character and become “a businessmen’s sort of trade association meeting.” Friedman attributed this loss of quality to the Society’s success in spreading its ideas. Yet he convened a meeting of the surviving founders and proposed that the MPS be dissolved after its twenty-fifth anniversary in 1972. 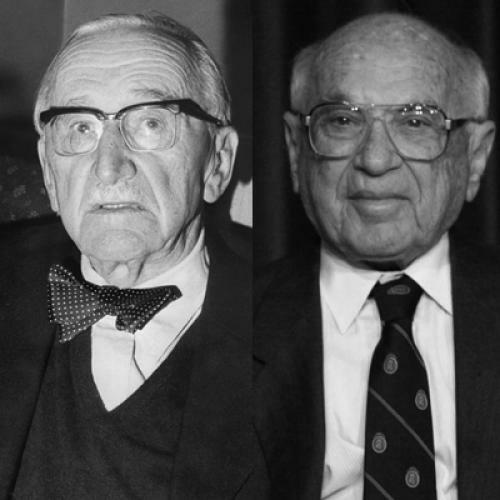 This suggestion was rejected by the smaller group; but it is clear that Hayek’s original goal had not been achieved, and the action had passed into Friedman’s hands and therefore with Friedman’s goals and methods. If MPS had ever been a force, it was no longer needed. Burgin thinks that the MPS had served the purpose of providing a sort of institutional home for the cultivation of neoliberal ideology. I am skeptical, except in the sort of clubby sense already mentioned, but of course I was not there. I have already referred to Friedman’s early, detailed empirical study of the incomes earned by doctors, lawyers, and others in independent practice. Burgin emphasizes Friedman’s general empirical orientation. Hayek, at least the Good Hayek, was interested mainly in high principle, while Friedman more often appealed to facts as being decisive in policy choices as well as in analytical matters. It is true that Friedman could be infinitely subtle in criticizing a student’s empirical work; but he could also be rather lax in finding support for his own opinions. To take one example, Friedman proposed abolishing the Food and Drug Administration because the harm done by its excessively cautious delays in approving new drugs outweighed the dangers that would come from simply making drugs freely available on the open market. How could he, or anyone, possibly know that? One can indeed imagine an immensely complicated empirical study, requiring all sorts of assumptions and approximations, the outcome of which would inevitably be clouded by complexity, guesswork, and great uncertainty. But that would win no hearts or minds. Friedman’s confident assertion just sounds like fact-based knowledge. A different sort of person would have looked for ways to speed up the FDA’s approval process. THESE MATTERS OF personal style actually count for something. One of the great merits of Burgin’s book is to show how the character and the content of the free-market ideology changed when the flag passed from Hayek and Company to Friedman and Company. Despite the efforts of a small band of the faithful, the Tea Party is, and is likely to remain, more Friedman than Hayek: harder-line, more brashly confident, less concerned with getting things quite right, and without sympathy for losers. It seems to me that Friedman’s professional life was more closely entangled with his political activities than was the case with Hayek or any of the other personalities in the story. In that connection, Burgin reports, and seems to credit, a belief among the faithful that Friedman’s Nobel Prize was delayed by elite hostility to his public role as a champion of free markets. I had never heard that story before, but in any case it is absurd. The Nobel Prize in economics is not about advocacy. It is intended to reward important contributions to the discipline of economics. Friedman’s was the eighth to be awarded after the prize was established. A knowledgeable person looking at the list of winners of the seven previous prizes—Hayek was one of them, by the way—would see that their scientific contributions matched or exceeded Friedman’s. A more plausible case might be made that Friedman’s prominence on the public stage led to some overestimation of his professional achievement. His most important work, particularly cited by the Swedish Academy, was on the relation between consumer spending and income. He proposed that consumer expenditure responded primarily to long-run income prospects rather than to current income, and he suggested a particular measure of those long-run prospects that he called “permanent income.” This was indeed an important and useful idea. Something like it had been anticipated in much less satisfactory form by James Duesenberry, and Franco Modigliani developed a similar and in some ways more satisfactory theory at almost the same time. Friedman’s A Theory of the Consumption Function, which appeared in 1957, was a major work by any standards; but monetarism, the doctrine that autonomous change in the supply of money is the main actor in the determination of aggregate nominal income, has not proved to be tenable analytically or empirically. His Monetary History of the United States, 1867–1960 (written with the late Anna Schwartz), while highly interesting, is not a towering intellectual achievement. Burgin is interested in a large question: how much did the ideas and the persuasive efforts of the MPS circle and the Friedman succession contribute to the widespread turn to the right in the politics of the Western world after 1970? How much did Ronald Reagan and Margaret Thatcher owe to Friedrich von Hayek and Milton Friedman, and how much did Hayek and Friedman owe to Reagan and Thatcher? Burgin clearly attaches a lot of importance to the respectability conferred on the political right by the ideas of Hayek, Friedman, and the others, and to the rhetorical devices they developed. I would not disagree, but it is of course a much more difficult matter to weigh these effects against more pedestrian facts: Thatcher profited from an ill-judged miners’ strike and, as Lyndon Johnson famously remarked, the passage of the Civil Rights Act lost the Solid South for the Democratic Party for at least a generation. For a serious modern reader, the rhetoric is irrelevant or, worse, misleading, or, even worse, intentionally misleading. Everyone has known for a long time that a complicated industrial economy is either a market economy or a mess. The real issues are pragmatic. Which of the defects of a “free,” unregulated economy should be repaired by regulation, subsidization, or taxation? Which of them may have to be tolerated (and perhaps compensated), at least in part, because the best available fix would have even more costly side-effects? To the extent that the MPS circle made that kind of policy discussion more difficult to have, it did the market economy a disservice.